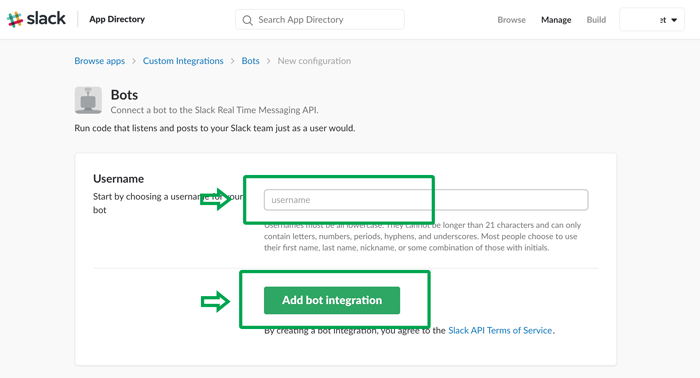 A simple comprehensive step by step tutorial of building a simple Slack Bot using Spring Boot and MongoDB as a Worker. 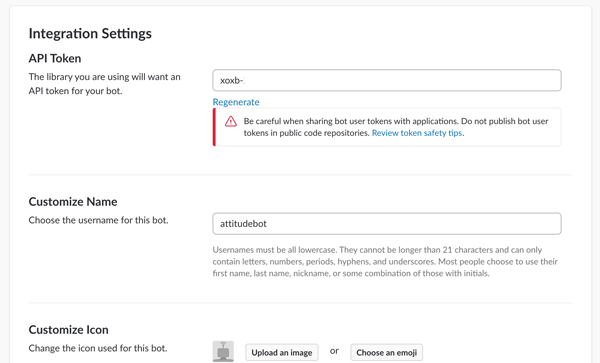 This Slack Bot application using JBot library. Actually, there's a lot of Slack Bot library for Java (find here), but we just want to try this JBot library. 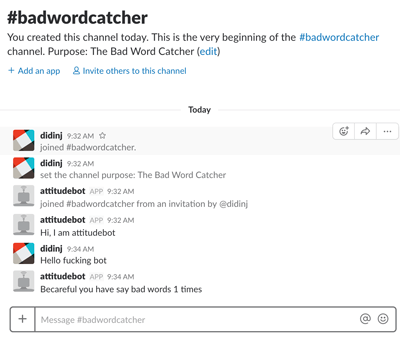 The Scenario for this tutorial is simple, just a Slack Bot for catch the keyword from a conversation or chats that contains harsh words or bad words (ex: fu*ck, sh*t, b*tch) then save it to MongoDB include with User who sends it. 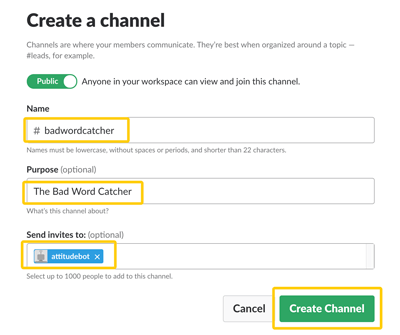 The Slack will count that words from MongoDB until getting 5 words then the Bot will send back the message to channels to warns the sender of bad words. We assume that you have installed Java 8, MongoDB and IDE or Text Editor. So, we can continue straight forward to the steps of the tutorial. As our previous Spring Boot tutorial, we will generate a Spring Boot application online by going to Spring Initalizr on the browser. Choose to generate a Gradle project with Java and Spring Boot 1.5.9. In Project metadata fill artifact coordinate group with your package ID (example: `com.djamware`) and artifact by your app name (example: `slackbot`). Search dependencies for the term of `MongoDB`. Finally, click Generate Project button to generate and download zip file contains initial Spring Boot project. Extract that zip file to your workspace or projects folder. Now, open the project in the Netbeans. It will load all dependencies automatically, just wait until finished. After that, you will see the directory structure like this in the files navigation. Every bad word catch from Slack message save to MongoDB collection including the sender of the message. For that, we have to create a Java class that represents a model for bad words collection. If you are using Netbeans (similar with some IDE), right-click project name then click `New` then click `Java Class`. That `BadWord` class mapping to `badword` collections of MongoDB which has 4 fields (id, user, word, updateDate). Each field has getter and setter except for updateDate has a default value for the current date. Don't forget to add MongoDB configuration to the `src/main/recources/application.properties`. Now, we need to create an interface for connecting BadWord model and controller. On Netbeans right-click project name on projects left panel then choose `New` then choose `Java Interface`. On the New Java Interface dialog, git it name `BadwordRepository` and package name `com.djamware.slackbot.repositories` then click Finish button. Next, replace all codes with this few lines of codes. 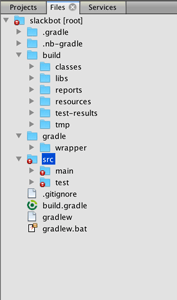 Back to business, open and edit `build.gradle` from the root of the project folder. Add JBot dependencies to dependencies block. Then run compile by open the `Run` menu then choose `compile file` or just click on `F9` key. Now, the library is ready to use with your Java application. It's time to make a Java Slack Bot with Spring Boot. Open `application.properties` on the `src/main/resources` folder then add this lines of codes. 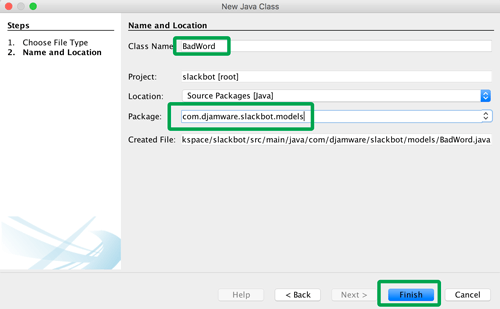 Next, create a Class file in the package `com.djamware.slackbot.bot` with the name of the file `SlackBot.java`. After the new class file opened, add extends to the class name and add annotation above the class name. Declare the variable for logger on the first line of the class body. Declare a variable for getting the token which handles by JBot library. Next, create getter methods for token and JBot library. Now, create a methods for receive direct message (DM) to the Slack Bot. For catching bad words, we have to add a method `onReceiveMessage` and create filter by message string pattern. The bad words declare on the pattern if found one of them then save it to the database. After save, count by user ID then check if bad words exceed the maximum allowed 5 words then the response to the channel with a warning message. To test and run the Slack Bot application on the local machine, make sure your MongoDB is running. Then open another terminal to run the Slack Bot by typing this command in the project directory. Open the Slack app from your browser or desktop app then log on to it. Create a new channel from the left navigation menu of the Slack app. Then fill the new Channel form like below. Click `Create Channel` button to finish. Now, your channel is ready. Type something contains bad words in the text field below the Slack App. If it catches then you will get the response like this. That's it, a simple Slack Bot example using Spring Boot, MongoDB, and JBot. Actually, JBot `getUser()` method returns `null` so for saving user who types the bad word to DB using user ID. There's some Slack Bot library for Java out there that might be fit for your requirements, this is just an example of Slack Bot integration. For the full working Source Code you can find in our GitHub.